Facials are extremely important as they help in keeping your skin radiant and glowing. They nurture your skin, replenishing it with all the essential skin nutrients. It promotes skin lightening by reducing blemishes and stimulating a healthy cell growth. Each one of us wants a flawless skin. But let’s face it, how many of you actually have the time to visit a beauty salon for getting facials? Now, with the help of special facial kits, you can rejoice the salon beauty services in the comfort of your homes. 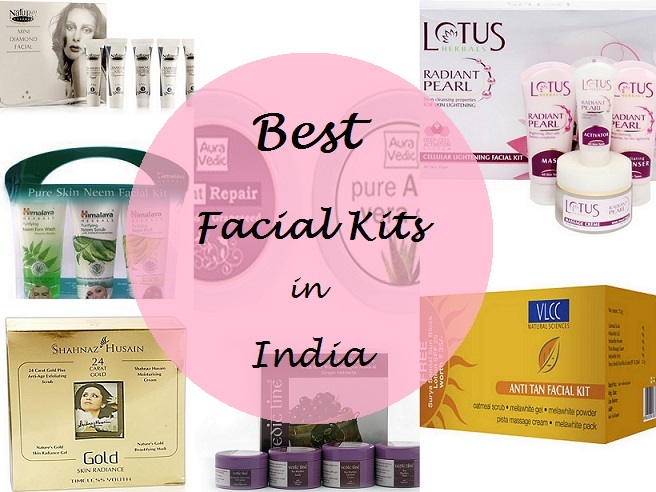 The review assembles a list of the best facial kits in India, which you can easily locate in the market to get a glowing skin instantly. Who wants to look like 40 at the age of 32? Facials offer the most perfect anti-ageing treatment. They help in balancing the skin, giving you a youthful look thereby decreasing your chances of having to spend extra money on expensive beauty procedures and injections. They focus upon revitalizing your skin through effective cleansing and discarding the dead skin cells. Facials enhance the skin texture and suppleness by preventing the vandalizing effects of exposure to sun and pollution. There are specific facial treatments for people with oily and dry skin. However, getting these treatments at beauty salon might just prove to be extremely exorbitant and time consuming. In order to effectuate an easy and comfortable skin care regime, many renowned cosmetic brands have developed amazing facial kits which can be easily used at home. These kits can be used at any time without including the hassles of going to a beautician. You may often find yourself asking, ‘What is my skin type or that which facial treatment would suit my skin type best?’ Choosing the best facial kit for your skin requires a deep understanding of your particular skin type. The following points will help you decide the right blend of products that you should use to ensure a healthy skin. For Oily Skin Type: All of you having an oily skin, should go for deep skin cleansing lotions as that helps in removing the excess oil and the dirt from the skin pores. Scrub should be a tough one as it will exfoliate the skin and scale off the zits. Use a light massage cream followed by a clay and powder mask application that will effectively dry out the oils. Milk and fruit based facial kits are best suited for oily skin types. For Dry Skin Type: Dry and flaky skin should be treated with mild cleansers and gentle scrubs. You should use intense moisturizers and hydrating serums to add the required moisture to the already cracked skin. Go for a deep massage. Apply moisturizing masks instead of powdered ones. Go for an oil based facial treatment. Cream and water based facial kits are ideal for people with dry skin. Normal Skin Type: It is easy to decide a facial cream if you have a normal skin type. You can go for any mild to intense skin cleansing cream followed by a light scrubbing session. You can use a mild or intense moisturizing creme gel and a hydrating face mask. Fruit facials, honey or any cream based facial kit is perfect for your skin. Shahnaz Husain is an extremely reputed brand, offering an extensive range of skin friendly products. The age defying facial kit focuses upon skin rejuvenation, giving you a younger and radiant look. It helps in skin tightening and reducing the heavy signs of ageing. After deep skin cleansing, gently rub the gold facial scrub on your face and neck in circular movements. Rinse and wipe it off with a moist cotton ball. Lastly, apply the gold mask, carefully avoiding the lip and eye area. Keep for 15 minutes and then wipe off. 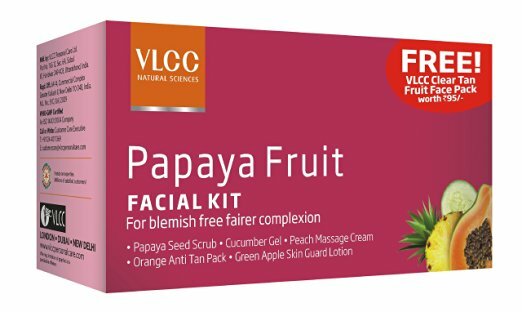 VLCC Papaya Fruit Facial kit comes as a single time utility kit which helps in deeply cleansing the skin and removing the sun tanning. It focuses on lightening skin blemishes and pigmentation and reducing the enlarged skin pores. It provides an even and fairer looking skin tone. For better results, use with a fruit bleach cream. The papaya seed scrub removes the skin blemishes and pigmentation. The cucumber gel refreshes the skin by giving it a cooling effect. The massage cream reduces visible signs of aging and treats wrinkles. 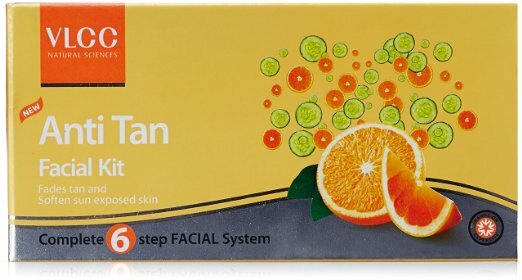 The orange anti tan pack provides a fairer complexion and finally the green apple lotion closes all he skin pores and prevents pimples. 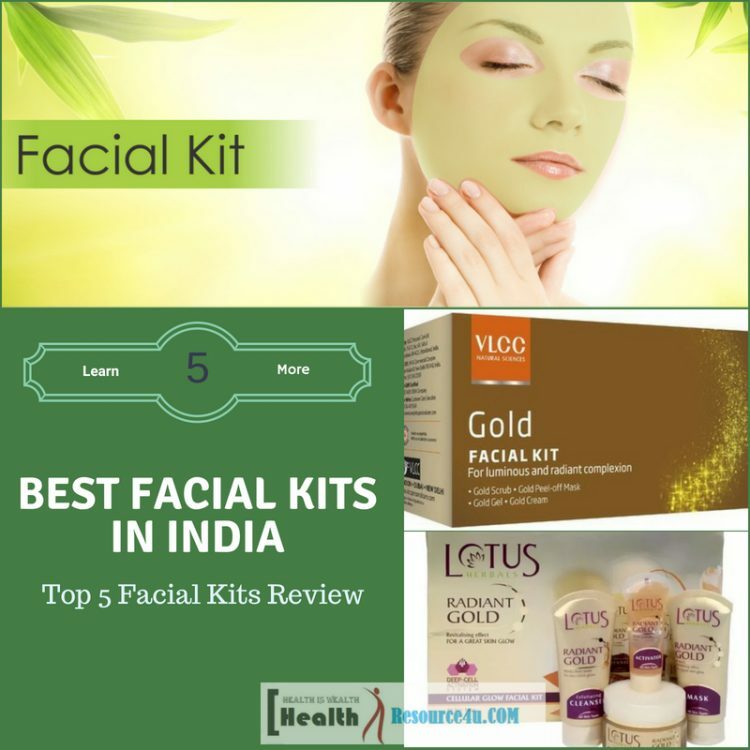 The kit uses natural Ayurvedic ingredients making the skin even and glowing. Mix the papaya scrub with water forming a smooth orange paste. Apply it to the face and neck and let it dry for 5-7 minutes. Scrub the face and wash it off. Apply the cucumber gel for 20 minutes and wipe it off with moist cotton. Take the peach cream and apply a mild quantity on the face and neck. Apply the orange anti tan pack and let it dry for 15 minutes. Rinse it off. Finally, apply a little amount of green apple lotion on your face and neck. 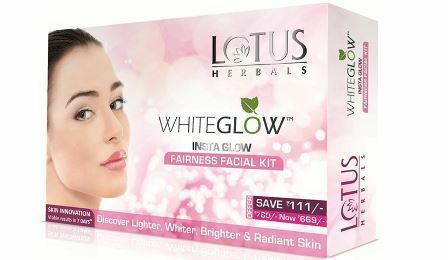 Lotus Herbal Whiteglow Insta Glow Facial kit is a great product which handles pigmentation and brightens up the skin by reducing dim spots. Based on Ayurvedic ingredients, it is enriched with natural extracts. It enhances skin radiance by maintaining absolute moisture balance. The kit contains deep cleansing facial form that removes all dirt and oil, giving a lighter and brighter skin tone. The skin whitening and brightening creme gel provides complete protection against UVA and UVB rays. It is dermatologically tested and is highly suitable for all skin types. Use the cleansing milk to remove all makeup traces dirt from the skin pores. Take a small amount of it on a moist cottonball and clean the face and neck. Apply the scrub on the wet face and rub for 5-7 minutes. Wash with cold water. Take the whitening cream and gently massage the skin for 10 minutes. Apply the yogurt face pack and keep it for 15 minutes. Wash it off with cold water. VLCC presents a great product that contains natural extracts from pistachio, oatmeal, cucumber, nutmeg, aloe vera and winter cherry. The effective facial treatment helps in restoring smooth and glowing skin, fading away all the sun tan. The Ayurvedic ingredients, leave the skin fairer looking and radiant. Highly recommended for all skin types. Oatmeal scrub is a powder based scrub. Add water and scrub the face and neck for 2-3 minutes. Wash it off. Pat the melawhite gel on the face and neck. Massage for 10 minutes and then leave it for another 5 minutes. Wash it off. Take the melawhite powder and mix it with water. It forms a thin paste. Apply on the face and let it dry for 5-10 minutes. Massage a little and then wipe it off. Apply the pista massage cream evenly on the face and the neck. Keep it for 15 minutes and then wash. The de-tan face pack has little thick consistency. Apply on the face and neck and let it dry for 5-8 minutes. Finally, wash it off. 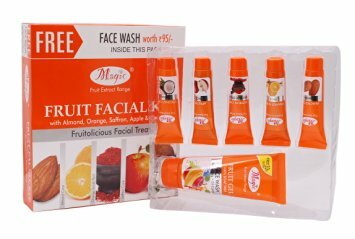 Nature’s Essence Magic Fruit Facial kit is a unique mixture of vitaminized fruits along with coconut, apple, orange and pineapple. These fruit extracts impart a natural glow to the skin making it even and vibrant. The nourishing elements help in skin polishing and give a fairer and younger looking skin tone. It is suitable for all skin types. The non-foaming almond cleanser removes all makeup dust particles from the skin pores. Take a little amount on a cottonball and thoroughly clean the face and neck. Apply the orange scrub on the wet face and rub for 5 minutes. Let it dry and then wash with cold water. Use the saffron cream and gently massage the skin. Apply the facial pack on the face and neck and let it dry for 15 minutes. Wash it off with cold water. Lastly, apply the moisturizing cream. Massage a little and leave it on.